Garbage Pail Kids began their lives as trading cards way back in 1985, just as the Cabbage Patch dolls were peaking in popularity. 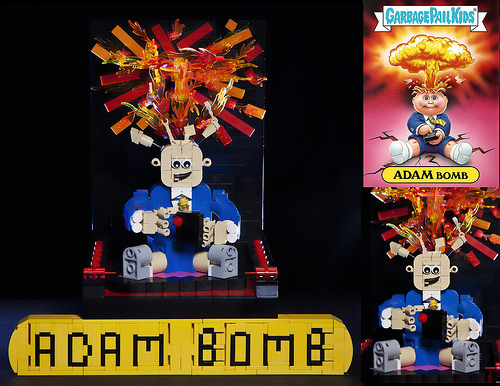 The Garbage Pail kids were a parody of the ‘nicer’ cabbage patch dolls with catchy names such as ‘Joe Blow’, ‘Moist Joyce’ and ‘Barfin’ Barbara.’ Damoncorso has chosen the explosively named Adam Bomb to build and has captured the character animatedly in LEGO. If anyone else is looking for inspiration from the Garbage Pail Kids, there are about 660 of them in total so there are plenty more gross images to chose from.